Create a NEW project for this challenge. Be sure to link your blog with a direct link to the post you would like us to visit. 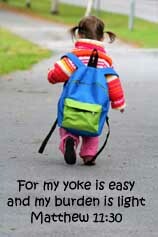 Please put a link on your post to our challenge. Create a project with only 3 challenges including our challenge. Feel free to use any stamping products you have! 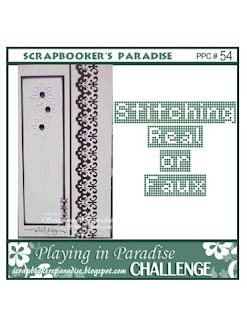 This week's challenge is to create a card, scrapbook layout or project using real or faux stitching. 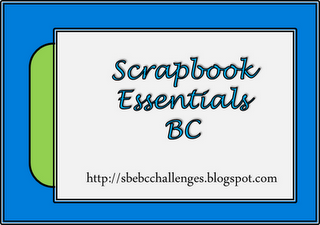 So here is my try at the challenges ....the stitching and the layout from Scrapbook Essentials..
she is the one who give it to me ...I loved it and it fit so well with this challenge. 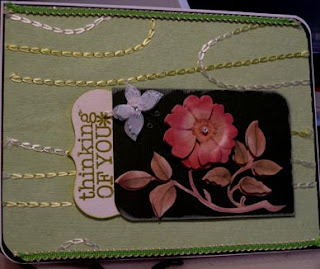 the thinking of you stamp... the $1.50 bin at Micheal's..
Glad you found some time to craft! What a creation...love all the stitching you included! 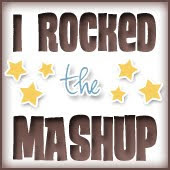 Thanks for playing at Scrapbooker's Paradise! I love this stitched paper! Very cool! Beautiful card Judy, I like how you have used that stitched paper.